One of the biggest concerns I hear from would-be bloggers is that they don’t have the technical skills to start a blog. Fear not, I had no technical abilities when I first started either. In fact, Single Moms Income was NOT my first blog. I started my first blog in 2010 and just as I got it to a point where it made it’s first $150 and I thought I was “getting it” I accidentally deleted the entire blog and all the backup files. Ooops. So when someone tells me that they’ve been wanting to start a blog but are afraid of the technical side I TOTALLY get it. Luckily, over the years I’ve spent blogging I’ve gotten pretty good at a lot of the technical stuff that used to scare the crap out of me. I decided to make a free email course that will help all of my technically-challenged friends get the basics up and running. Nice of you to offer it for free. I know some who already make six figures per month and would probably charge for this. Have a great weekend! 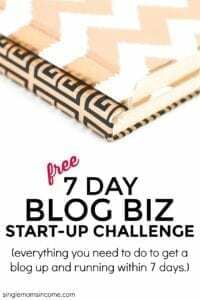 I am interested in the 7 day blog biz challenge.